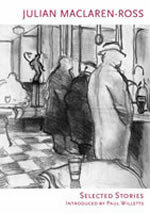 Julian Maclaren-Ross (1912-64) was born in London, the youngest child of a Cuban father and an Anglo-Indian mother, and grew up in Britain and on the French Riviera. He worked as a door-to-door vacuum-cleaner salesman before being conscripted into the army from which he later deserted. 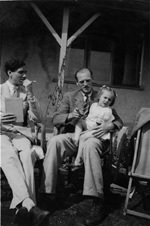 Having been discharged from the army after a traumatic spell in a psychiatric hospital, he found a job working with Dylan Thomas as a screenwriter. Invariably clad in dark glasses and an imaculate suit, augmented by a malacca cane and silver snuff-box, he soon established himself as a pivotal figure in wartime Soho's thriving bohemian pub and club scene. Throughout the Fifties, he supported himself by penning novels, journalism, translations, radio plays and screenwriting for low budget British feature films until his death of a heart attack aged fifty-two. The posthumous publication of his partially completed Memoirs of the Forties and his inspiration of the character X Trapnel in Anthony Powell's A Dance to the Music of Time has secured him his niche in literary history. 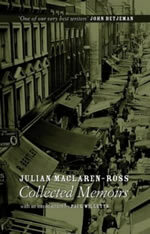 "It was a great treat to discover the writing of Julian Maclaren-Ross. Witty, smart, eccentric - he never ceases to entertain." 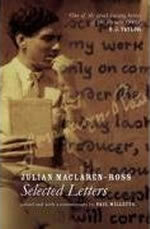 Julian Maclaren-Ross’s Of Love and Hunger was Radio 4’s Book at Bedtime last week. 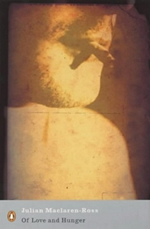 This week, Radio 4 ran an excellent documentary about his life, called Mr X: Julian Maclaren-Ross.